oh wait, that's just the torrential downpour going on outside, washing and blowing away what remains of the saffrons and reds. wish i'd caught your post earlier - i would've loved a bowl of sea bass and cilantro congee, "bean leaves," and sliced bbq pork on rice. and maybe some shrimp in rice roll? ps. 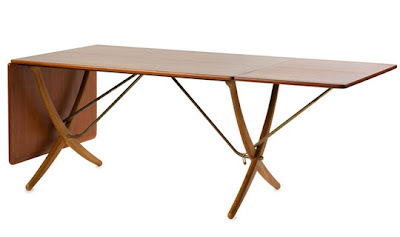 your recent post on vintage michelin attuned my eyes to this fine hans wegner table for sale down the street (totally different, i know, but a similar line and contrast happening...).